Freestanding gas stoves come in many styles, from modern contemporary, to traditional cast iron, with all the charm and appeal of a wood stove, with none of the mess or work. 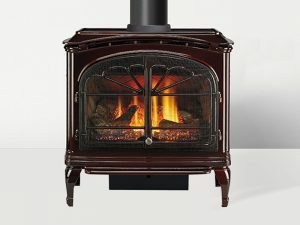 Vented natural gas stoves can be direct vented out a side wall, with no chimney, or in many cases, when replacing a wood stove, can simply connect to the existing chimney. Gas or Propane Stoves for home heating can be operated by a remote control or wall mounted thermostat, and will work with or without electricity, making them a great every day, or back-up heat source. We have a huge selection of the best freestanding gas stoves, available with a variety of looks and features, many of which can be seen operating in our Fireplace Stores in Ottawa and Carleton Place. Various Fireplace Sale and Promotions run all year long! Call today, and one of our experts can recommend the best gas stove for your needs. Need service or repair on a gas or propane stove? Our fireplace service department provides service and repair all gas stove makes and models. Modern European styling in a Modern Gas Tove. At home uptown, downtown, and everywhere in between. The Tiara I Gas Cast Iron Stove brings the timeless appeal of a gas burning stove into a new age. The Tiara II brings the timeless appeal of a burning stove into a new age. A small cast iron gas stove heater for smaller spaces The timeless appeal of a gas fire stove into a new age. LIMITED TIME SAVINGS UP TO $350.00! The Paloma Gas Stove takes a whole new approach to functional modern design. The Garnet is small in size, but big on performance. It’s the perfect option for your bedroom, den or dining room. These small gas-burning stoves are designed to heat the area you’re in. Top vent / rear vent convertible. 150 CFM variable speed fan. Charcoal fluted liner. Cast Iron Gas or Propane Stove – Heat Up to 1700 square feet. See it operating in our Ottawa Fireplace Showroom! The Trenton cast iron gas stove combines the traditional design with today’s modern gas technology. Built with heavy cast iron to retain and evenly distribute heat from the top and sides of the stove.